The iPhone 3GS comes with a brilliant 3.5 inches display with 480 x 320 pixels, the display is similar to the 3G model except for the addition of a "oleophobic" oil repellent coating that helps resists finger-print smudging. The 3GS is powered by a high speed 600MHz ARM 11 processor compared to the 3G's 412MHz ARM 11 and supports extremely smooth multitasking. It has twice the RAM (256 MB up from 128 MB) and support faster 7.2 Mbps HSDPA connectivity. It also comes with an integrated digital compass which syncs with with Google Maps for easy direction recognition. Where the iPhone 3G could only achieve 3.6mbps, the 3GS is capable of reaching the maximum speed offered by the HSDPA technology which is 7.2Mbps. These blazing Internet speeds allows faster browsing and downloads speeds. The 3GS supports OpenGL ES 2.0 compared to the 1.1 in 3G model. It also supports voice control which is not available in the 3G. The handset supports numerous third-party apps and lets you switch between them instantly without slowing down the device or draining the battery unnecessarily. 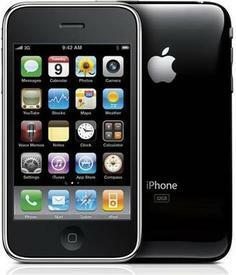 The iPhone 3G comes with Voice control feature which lets you play a song or make call with mere voice instructions. The iPhone 3GS offers high-speed 3G networks, expanded e-mail functionality and plenty of third party applications. It now renders faster access to 3G wireless networks, Microsoft Exchange server e-mail, and supports a barrage of third-party apps from the iPhone App Store. The iPhone allows seamless sync with your Outlook e-mail, contacts, and calendar and can support multiple POP3 accounts at once. This lets you keep work and personal e-mail accounts open at the same time, although you'll have to manually switch between the two. The iPhone 3GS uses Assisted GPS supplemented by satellites, which gives pin-point location identification. The phone automatically switches to tower triangulation when you enter a weak signal area or within buildings. It offers the live tracking feature so that you can monitor your progress as you drive (or walk) along. The 3GS stands unmatched when it comes to music and video player capabilities. The impressive touch screen and intuitive navigation allows easy scrolling through lengthy song lists or browse your music collection with the Cover Flow view. The iPod menu by default has shortcut icons for Playlists, Artists, Songs, and Video; however, you can swap these for Podcasts, Albums, Audiobooks, Composers or Genres. It supports MP3, AAC, Audible, Apple Lossless, WAV, and AIFF audio files, and MPEG-4 or H.264 video files. As to be expected, it does not recognise Windows Media file types such as WMA audio or WMV video. The handset's audio quality and EQ enhancement features are good enough to make your existing MP3 player redundant. The iPhone 3G's almost perfect set of video features including video podcast, a dedicated YouTube player, auto-bookmarking and full-screen resizing. The iPhone 3G's video quality offers no surprises, and is one of the best you'll find on a mobile phone. The handset supports fast contact locate feature; typing in any part of your contacts name will directly take you to that entry. The iPhone 3G is preloaded with iWork documents app, which lets you view PowerPoint e-mail attachments. The phone supports the Bulk Delete feature; it works only in your email in-boxes and lets you delete multiple messages at once with just a touch highlight. The iPhone 3GS sports an improved 3.0 megapixel camera with VGA video recording at 30 FPS as well as autofocus, macro, and white balance support. Apple has included the "tap to focus" feature, and new basic "video editing" capabilities on the iPhone 3GS.